The following is a review of the Middle Earth Pipeweed Series. This review is of the blend Longbottom Leaf produced by justforhim.com. I reviewed this weed on 2/18/06 and must say my tastes have changed as of 1/2/09. The casing on this blend is a little too much for my pallet these days but if you like aromatics and are scared to try English this is a decent start. 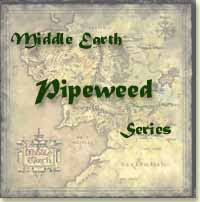 This is the first in the Middle Earth Pipeweed Series! Fragrant Virginias are blended with a hint of vanilla to produce the finest leaf the Shire has to offer! Long-Bottom Leaf is a special blend from Just For Him. They classify it as aromatic English. Start: Light and tiny whiffs of vanilla trickle out. Not overdone just notable. Mid-Bowl: A consistent smoke here and a pleasant change if your looking for something with a little added flavor to mix things up. Hints of cinnamon oatmeal here too. Finish: Finishes as started...good and tasty. Non-smokers will enjoy the room note...not over-powerful just pleasant. Light on the artificial flavoring this blend is enjoyable. Nice to try but won't keep it on hand. The best I have had, in this genre of smoke, is Just For Him blend available from justforhim.com. It starts off creamy and rounds off into a delicious nutty euphoria.